Like all good stories, some elements need to be teased out as the reader goes along with the plot. 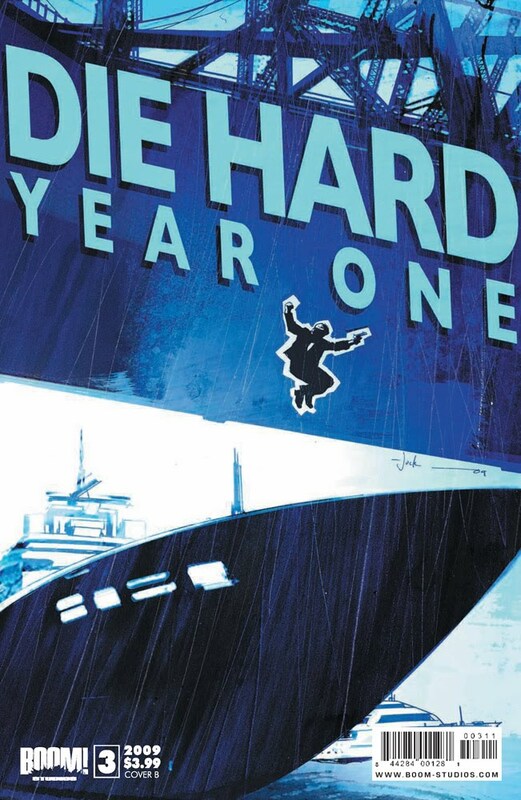 With this issue of Die Hard Year One, some of the pieces start fitting together until, by the time we get to the final pages, the picture is looking more and more complete - and it is not a pretty scenario for John McClane and Rosie Haskell (the girl who, in issue 2, was in the worst place at that the worst time). One slight negative is the rendering of Haskell - she constantly seems to have her mouth agape, for no particular good reason, and seems more of a 'dizzy blonde' than she really needs to. Sure, she is a 'damsel in distress', but the rather vacant expressions she pulls is a bit of a distraction - and slightly comedic (surely not the intention). Some nice retro fashion depicted in the art though - and those hairstyles (all flicks and bangs) are great. Verdict. Another strong episode. Not a lot more to say than that. I will give it an 8 out of 10 happily. "After cheating death, Nola Thomas wakes up alone in a deserted New Orleans hospital. Bruised, broken, and badly burned, she emerges from the floodwaters of Hurricane Katrina with one thing on her mind...revenge"
It is her life prior to Katrina that gives this story depth and warmth to the otherwise brutal and sparse beginning and ending of Nola #1. We know that Nola has a close relationship with her Mother (and her Mother has the best line - something about wheelchairs and geriatric shenanigans that was delivered with sly wit and made me chuckle). Nola is having an affair with a married man, and that relationship seems destined for heartache - but actually turns into something darker and is the catalyst for Nola's shocking transformation. Verdict. Intriguing, highly readable and one that you may find putting on your pull list if you give it a chance. I recommend it. 8 out of 10. A rather exquisite mini series comes to an end. 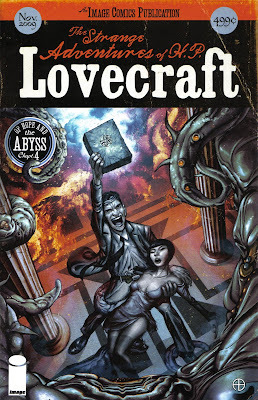 The Strange Adventures of HP Lovecraft has been a cut above most comic book titles, with every detail - from the distressed, pulp novel feel of the cover, to the Jung quotes and the the obvious love and knowledge of Lovecraft - meticulous. In this final part, Howard Lovecraft battles the unthinkable and unknowable horrors, while trying to rescue the (unrequited) love of his life. At the same time, the police are closing in on Lovecraft, while his ill Mother and elderly Aunts (who again put in a brilliant cameo appearance) strive to protect their son and nephew. The art is absolutely stunning, with Tony Salmons lavishing us with several splash pages that give full reign to the horror of Lovecraft-ian imagery. The story, courtesy of Mac Carter, celebrates Lovecraft's journey from weak and fragile, self-loathing failed writer to heroic warrior, battling shocking supernatural horror and emerging as a celebrated, empowered novelist of the unimaginable. The plot rattles along as the art - all muted tones and sombre or rain sodden locations - propels the reader into the dark heart of the madness. Verdict. The complete package. 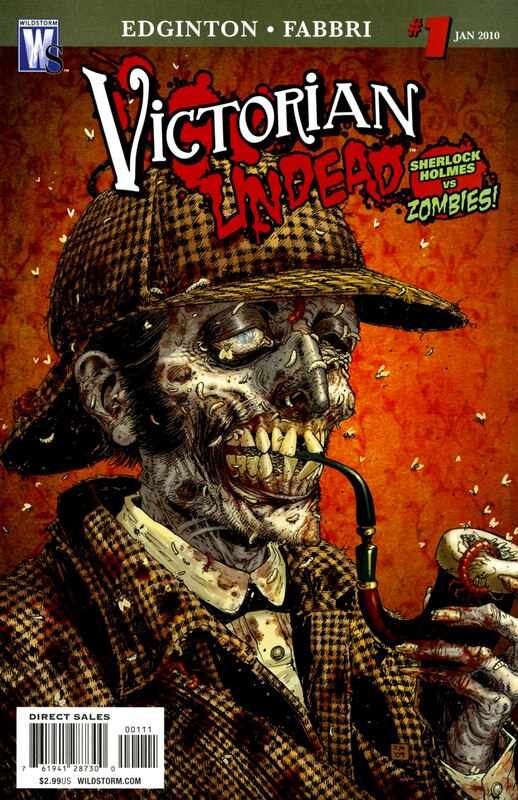 It treats the readers with respect and provides, over 4 issues, wonderful art and a thrilling story. I think it has the ability to turn a few people on to the thrilling imagination of Lovecraft and may well inspire readers to check out the source material. 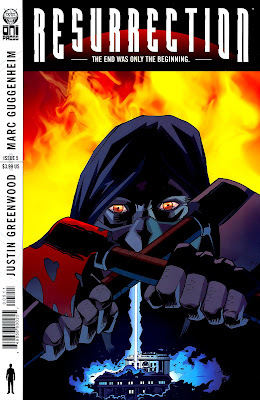 Not bad for a comic book.....9 out of 10 for the issue, and 9.75 out of 10 for the series as a whole. This will be a must-have trade when it appears in the book stores. The brakes are being applied in this issue as our group of survivors resume their daily mundane existence, the 'Hunters' barely merit a mention. 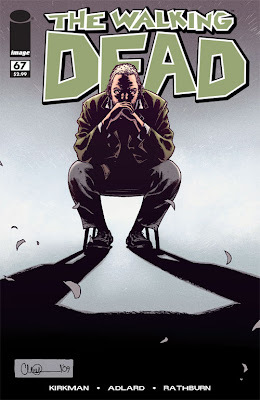 Rick & Carl get to do another father & son heart-to-heart, and while I am usually a fan of them, this time I just felt that Carl was speaking in the exact same voice as Rick and it did not really work. Carl was speaking the words of a man, and no matter how much he has had to grow up, his reasoning behind why he had to kill Ben was too lucid and too sophisticated. 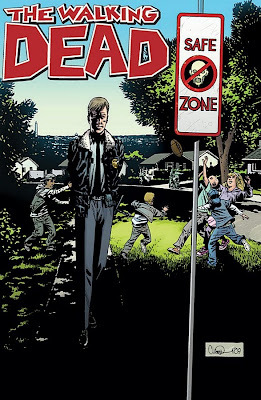 The need for food plays an important part in Walking Dead #67, and it has been touched on before, but I liked the way it dominated the early part of this issue. True to the solicit, we do find out the truth about Eugene, and I was quite surprised when it was over within a couple of pages - no long lyrical explanations, no soliloquy, just a rather mundane man with a mundane excuse. It rang true, as did Abraham's reaction, which was far more interesting. The art is, as ever, pivotal to the success of this book, as much as the writing is. Charlie Adlard gives some of the cast a more unkempt look this issue, especially Rick who is now sporting longer hair and a beard. 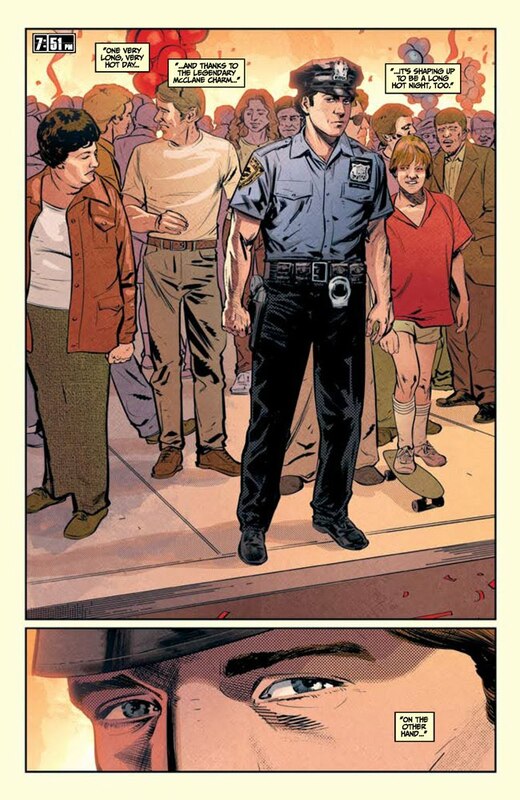 These subtle changes Adlard introduces also gives a feeling of momentum,of moving on from the 'Hunters' arc. 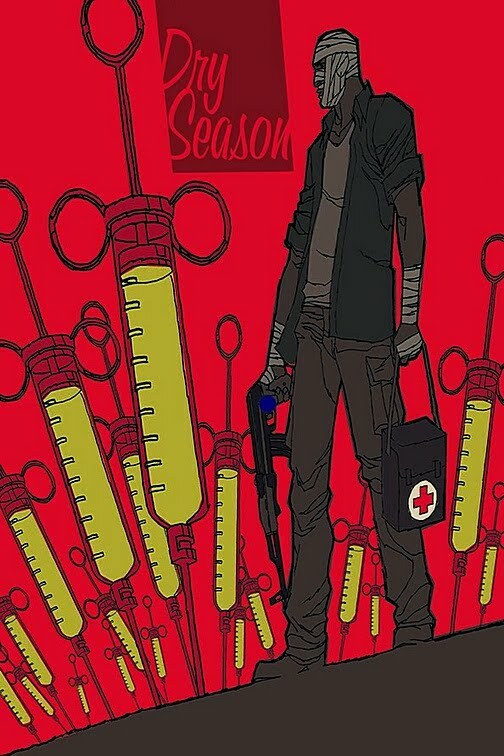 This issue felt like it was over too soon, but it was essentially a holding installment for a big reveal at the end, which is going to lead into a whole new set of variables into this most brilliant of dramas / zombie soap operas. 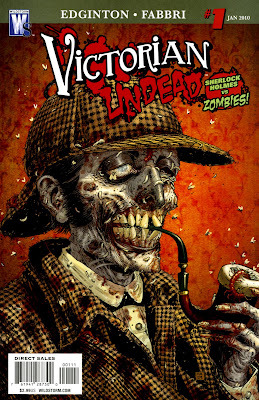 Speaking of the undead, there were a few around in this issue, but only in the distance, an indication, if any is needed, that although the title speaks of them, zombies play less and less of a role in these recent installments. What I am trying to convey is this - 'The Walking Dead' does not actually need the walking dead as a focus. The human drama effortlessly grabs your attention, leaving you wanting more. Verdict. Although the issue felt slight for some reason - maybe less dialogue, a few less panels - it is still full of quality, although the truth about Eugene felt a little flat. Regardless, this is still a top quality title. 8 out of 10. 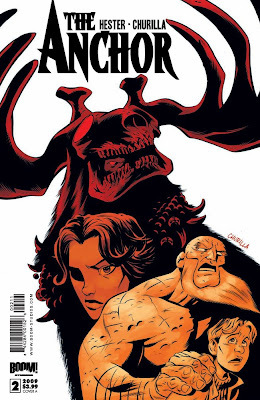 Well, the art is great - Churillo gives some great page art, especially when the huntsman arrives and a battle royale breaks out between him and The Anchor. The story is a bit bewildering at times (I did not pick up issue 1 for review - but I am going to go back and rememdy that), and there are a lot of panels in this issue, packed full of dialogue and action. There is a lot to get through, and you certainly get your moneys worth in terms of story. Verdict - Mystical, colourful, sometimes bewildering - and with great fight scenes! 7 out of 10. 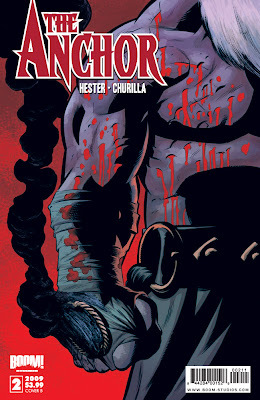 'The Anchor' #2 is out tomorrow (11th November) from Boom! 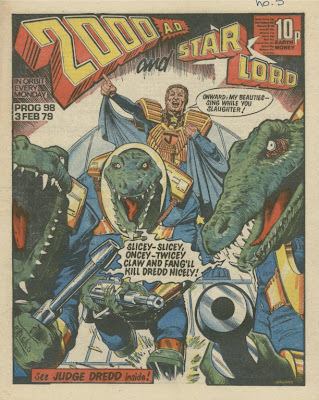 If you were to think about a list of 'lost' comic books that really need - in fact, demand - a reprint, what would you come up with? 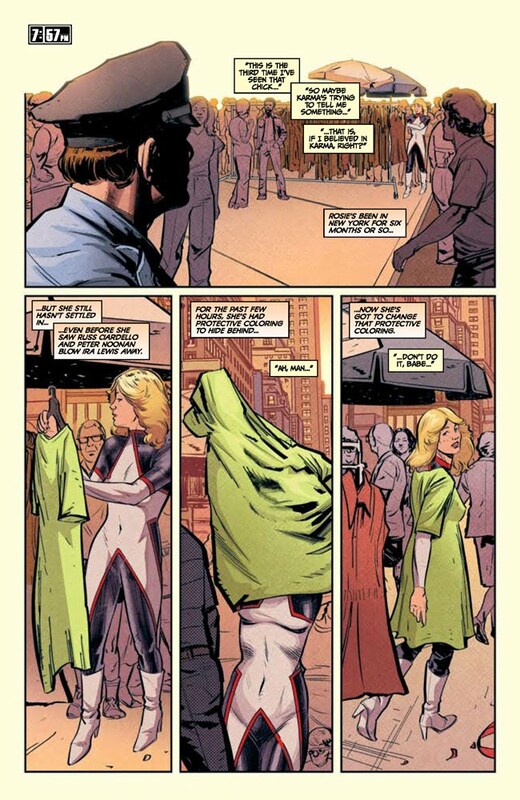 Alan Moore's 'Miracleman'? 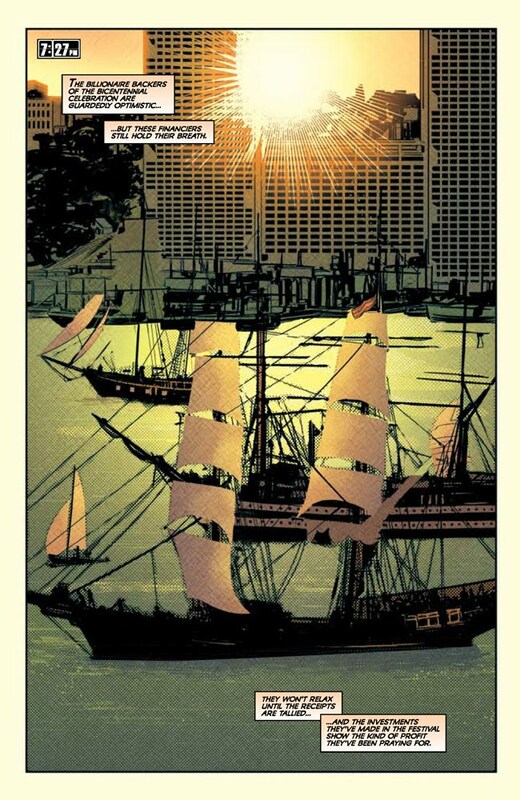 Morrison's 'Flex Mentallo'? Ennis' 'Hitman'? A reprint of IPC's 'Scream' title from 1984? The heavily politicised UK title 'Crisis' from the late 80's? What about Marvel Comics 70's / 80's Science Fiction titles like 'Micronauts' and 'Rom'? Some of those would be near the top of my list (and the good news is that we should be getting the full Marvelman / Mircaleman story from the 80's reprinted. 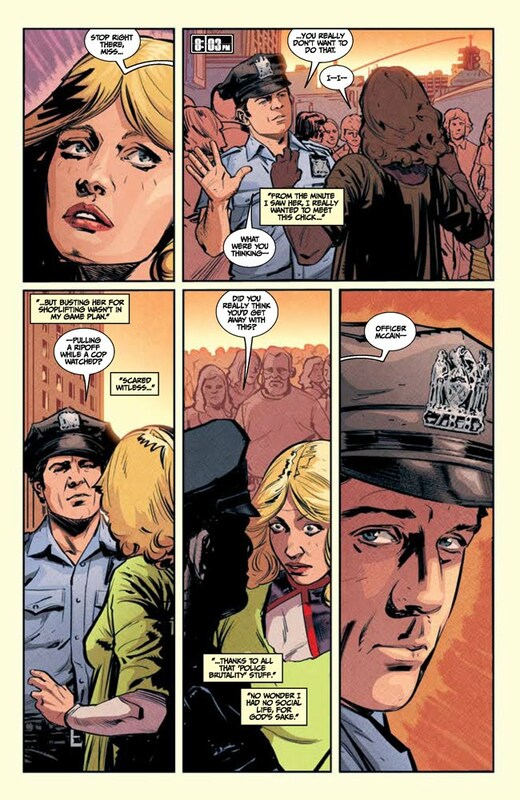 If you need more history on the convoluted and painful tale of Marvelman / Miracleman, see here. However, top of my list would be an excoriating attack on Corporate villainy and cowardice, and its effect on one tragic, angry young man. 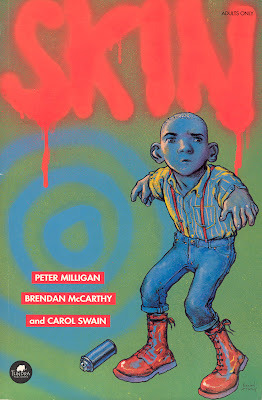 At the top of my list would be 'Skin', by Pete Milligan & Brendan McCarthy. 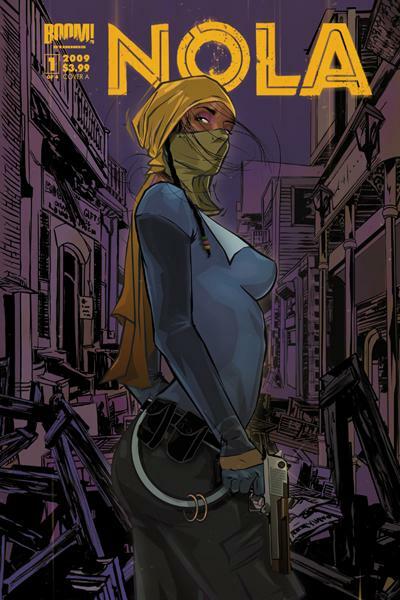 Skin is a 48-page graphic novel written by Peter Milligan, from an original story from the illustrator of the book, Brendan McCarthy, with stunning colours by Carol Swain. Within those seething 48 pages is some of the most angry, poignant, bitter and tragic comic literature ever published. And it was thanks to an unlikely source, Kevin Eastman, creator of Teenage Mutant Ninja Turtles, that this story ever did get published. 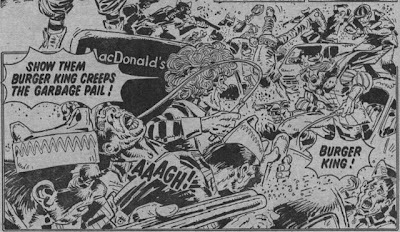 Originally destined for the Fleetway title 'Crisis' in 1990, it was rejected because of objectionable content. With the stories controversial subject matter potentially making it unpublishable, it was Eastmans Tundra Publishing that eventually picked up 'Skin' in 1992, putting it out as a graphic novel. 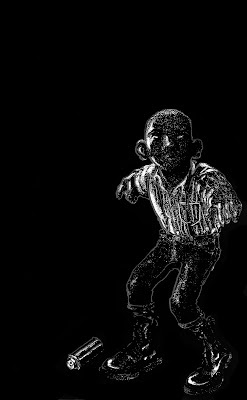 It tells the story of a young skinhead, Martin Atchitson (aka Martin 'Atchet), a 15 year old with Thalidomide birth defects (clearly seen in the image above), growing up in early 1970s London. 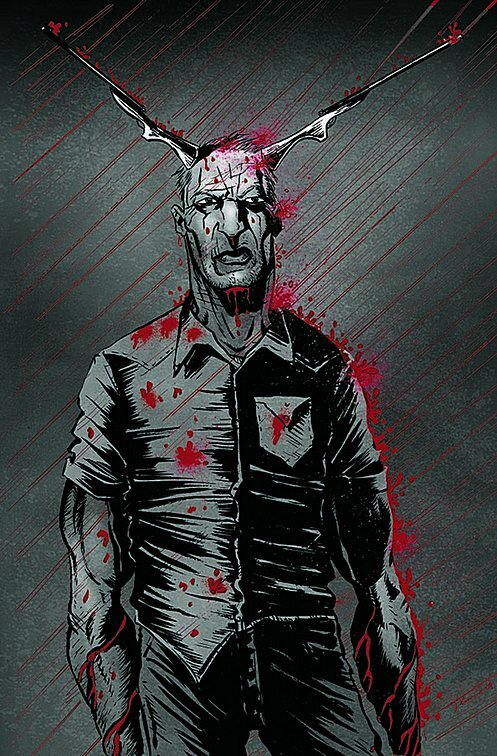 He is a 'Skin', or Skinhead, a predominantly white youth cult (though influenced by Black / Afro-Caribbean culture) that was mainly active in the 1960s and 1970s, before its style was appropriated and politicised by right wing extremists who believed in anti-immigration and carried out ethnic violence and football hooliganism. The depiction of this subculture is authentic, with all the Skinhead style on display - Cherry Doc Marten boots up to and covering the shin, Braces over the top of a Mod-ish shirt (like a Ben Sherman) or Fred Perry, with tight jeans rolled up to show off the full boot. Martin is accepted as a member of a local Skinhead gang, led by the violent, unpredictable Johnny Gorman. That acceptance is limited though, with the likes of Gorman and other gang members Steve Bennet and 'that prat O'Donnel' all, to some degree or other, bullying Martin because of his disability. Martin himself is also unpredictable, a mix of adolescence and impotent fury at his condition, leads to violent rages and his sexual urges manifest themselves in near sexual assault. A lot of this content can be uncomfortable to view, but none of it is ever gratuitous. When 'Cross-Eyed' Ruby, a girl Skinhead who obviously has feelings for Martin, educates him on the drug Thalidomide and its terrible effect on him, his rage becomes focused, crystallised, and a terrible denouement to this affecting story is set in motion. 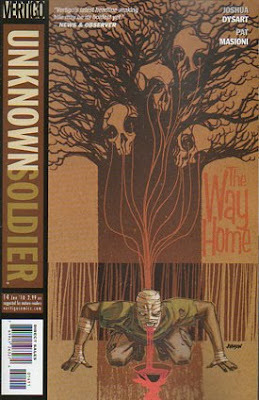 Sadly, as mentioned earlier, this profoundly affecting comic is out of print, and unlikely to reappear any time soon. However, copies do turn up from time to time on Amazon and ebay. Also, a group, Modern Life is War, produced a song called 'Martin Atchet', which is a tribute to this fantastic piece of work. There is a link to a youtube video here, which includes some of the artwork from 'Skin' - be aware that it is not for the young or anyone who is likely to be offended. 'Skin' is an affecting experience. Once read, and it can be easily done in one intense burst, it stays with you. 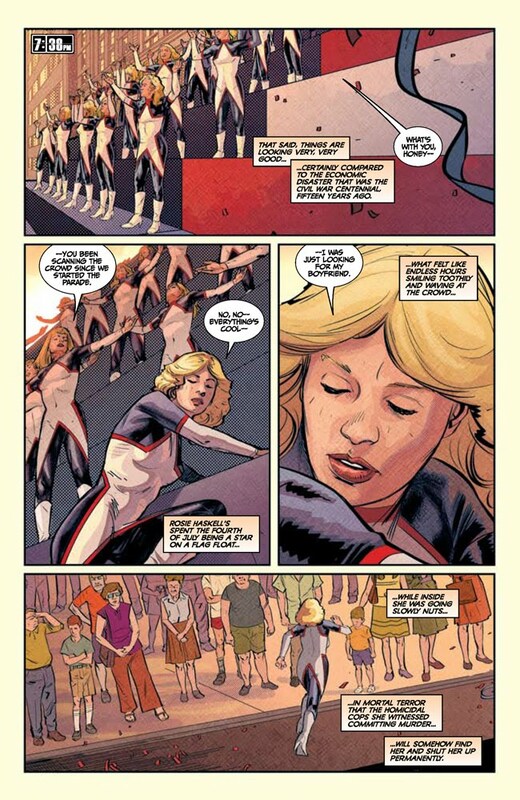 Not easily forgotten, 'Skin' needs to be reprinted, so a new generation and a new audience can appreciate an important piece of comic book fiction. This second volume detailing the chronolgical adventures of 2000ADs star in the ascendant is a real eye opener. The shift in quality from the earlier Dredd adventures is powered by one major change - Dredd goes epic. Twice. Consistency is another factor to the rise in quality inside this volume. 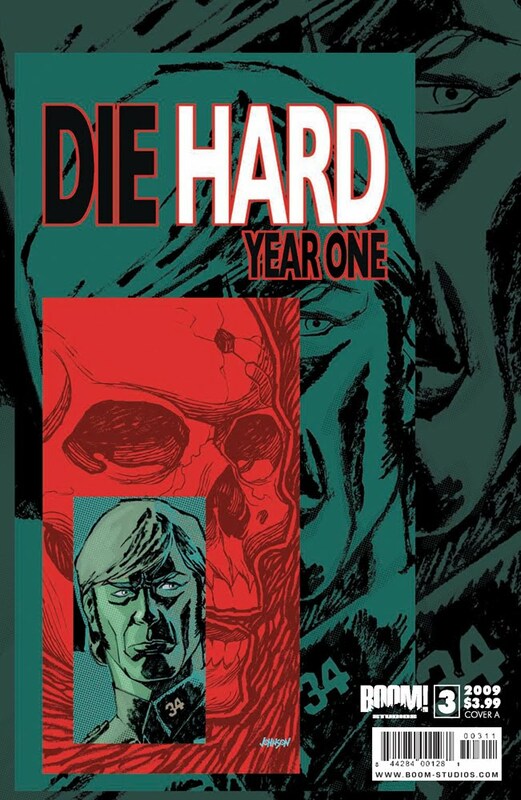 Just two writers (John Wagner, Pat Mills) and a handful of great artists (Brian Bolland, Mike McMahon, Ron Smith, Brett Ewins and Brendan McCarthy) produce over 300 pages of work, and there is very little in the way of filler. 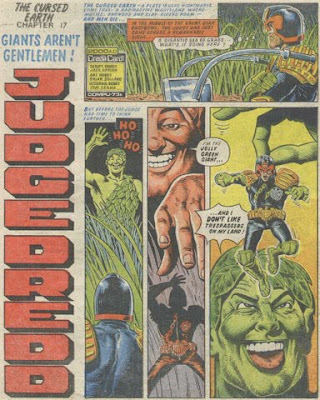 The Pat Mills epic 'The Cursed Earth' (with more than a nod to Roger Zelazney's 'Damnation Alley') is first, as Dredd and a motley crew of aliens, punk criminals and Judges try to deliver a vaccine to the ailing Mega City 2, and this journey across the radioactive wasteland between the 2 Mega-Cities provides the breadth and scope for Mills imagination to run riot as devastated communities in the wastelands, mutated flying rats, and gambling-obsessed mafia judges are all encountered by Dredd. By the time of the finale, when a robotic army (a legacy of the Atomic War attacks what remains of Dredds convoy, the pace is relentless and absolutley gripping. This is a tale of heroes and sacrifice, with artists McMahon and Bolland giving this tale a suitably epic feel to match the text. 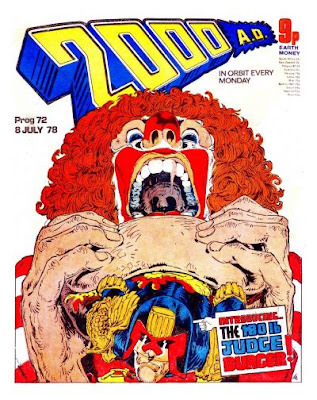 Apart from the 'Apocalypse War' and 'The Executioner' storylines, I don't think any other Dredd story has gripped me as much. 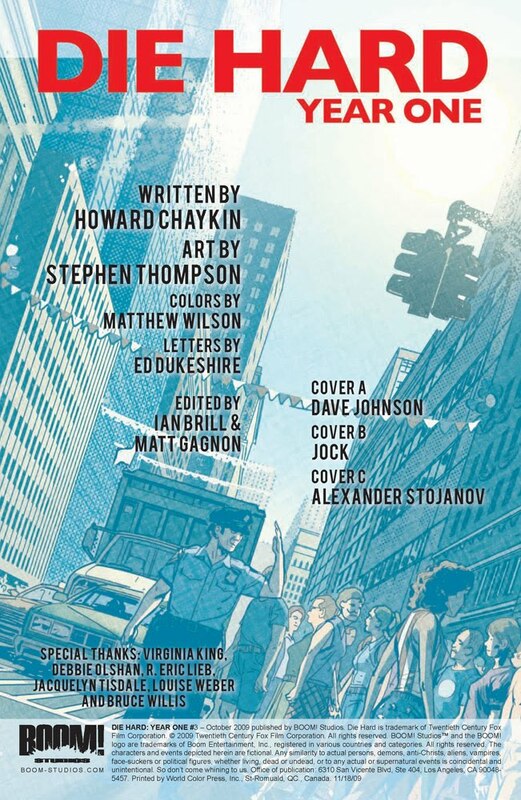 John Wagner's immediate follow-up, another epic entitled 'The Day the Law Died' puts a (plainly insane) Deputy Chief Judge, Cal, in charge of Mega City One after the brutal assassination of the ailing Chief Judge, Clarence Goodman. 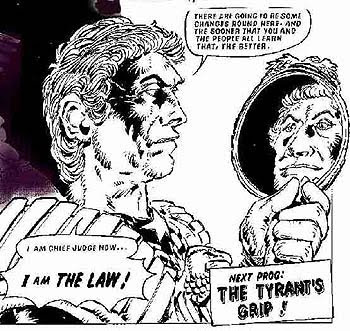 Like 'The Cursed Earth', in this second epic it is the most unlikely who step up to be heroes - for Fergee in 'The Day The Law Died! ', read Spikes Harvey Rotten in 'The Cursed Earth'. 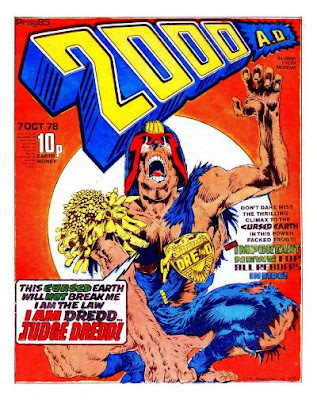 'The Day The Law Died', while not as diverse and without the same amount of all-out action, is as gripping, though it does suffer slightly from the fact that there were several artists working on this arc (some McMahon, some Bolland, some Ewins / McCarthy, some Bolland / Leach, and finally, the introduction of the mighty Ron Smith to the Dredd art roster). 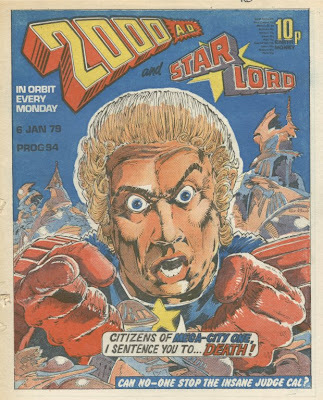 It loses a little consistency, especially in the various depictions of Cal (McMahon giving him by far the most terrifying look of a lunatic, whereas Smith made him look dashing in a Frank Hampson / Dan Dare style. 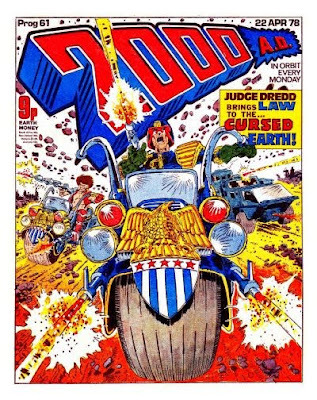 The finale, with Cal ready to put the whole City to sleep forever, while Dredd and his gang of resistance fighters race against time to stop him, is a classic. So, in summary, this second case file is much better than the first compilation - in fact it's a huge leap in quality, undoubtedly bolstered by the chronology which saw one epic follow another. The world of Dredd expands with the inclusion of some memorable characters - Tweek, Spikes Harvey Rotten, Judge Giant, Fergee, Judge Griffin - and we (thankfully) see a lot less of some others who were heavily featured in Complete Case Files 1 (Maria, Walter). Dredd himself is a lot less whiny, looks more grizzled, and in both epics actually comes across as a proper action hero. 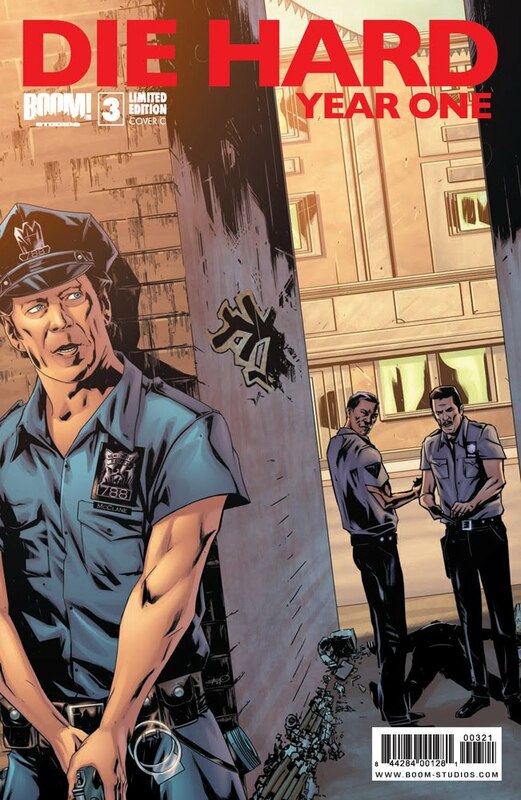 How Dredd is placed in these stories - as the saviour / hero of a whole Metropolis - suits the context. 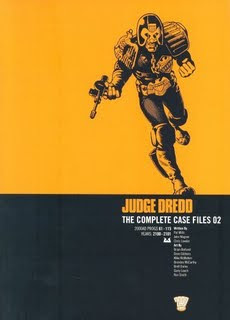 Things would change over the years, as Dredds position in his world would shift, but the stories in this volume of Complete Case Files place Dredd firmly as the man of the moment, unwavering in his faith in Justice and the right of the Judges to dispense it. And it really works well in these stories. In fact, it keeps getting better, as further 'Case Files' will prove. If you want an introduction to Dredd, and you are not bothered about being completist, then this is the volume to get - skip the first one, it is a bit of a chore to wade through.